1. Early Adopters - Who has this problem? - How do we identify an early adopter? 2. Solution - How will you solve the problems? - What features do you need to build? 3. Pricing/Revenue - What is the pricing model? - Will customers pay for it? While you can conduct the interview any way you want, whether by person, by blog, by emailing, the main point is to collect the information that you will need to validate your problem. Also, the interview script is merely a suggestion. If you can get the answers with your own ways, do go ahead! Use the space below to write your script. We’re building a step-by-startup guide that will provide action items for entrepreneurs like you build and grow your business. blah blah blah. - Have you started a company before? - If yes, how many? - If not, do you want to? - Do you use a lot of online resources for your work? So, one of the biggest problems we have is that we do a lot of startups, and it's always quite frustrating to not be really able to keep track of our progress, or knowing what to do, and when to do them. We find that we spend a lot of time scavenging over the internet for the newest MVP tricks, or growth hacking tricks. While we are seasoned entrepreneurs, we still prefer to have some kind of guidelines to keep us in check. Is this something you face as well? 1. What part of the demo or product you found most useful for you? 2. Which could you live without? 3. Is there anything you think is missing? Would you pay $10 for a frequently-updated course that will help you get in front of incubators by the end of the guide? Tip: Do not ask them how much they will pay. Tell them how much they will pay. Also, see if they are hesitant when answering your question. You can figure out what they feel about your pricing that way. We are almost done with our MVP, and I think we have a pretty awesome solution to help startups build and grow their business in an efficient manner. Thanks a lot for your time today. Do you think you'd be interested in using the guide when we have it ready? Would you know anyone who could be a good candidate for this topic? Spend 5 minutes to document the results. 1. Don’t ask questions that might get a polite response back. Asking a yes or no question or whether or not they will use your service will often yield a polite answer. 2. Always ask questions that will make them tell you what they already do right now as an alternative to solve their problems. 3. Probe their behavior instead of asking them questions that leads them to answer that they want to use your solution. 4. The point of the interview is to learn about them, not to sell to them. 5. The trick to get people to talk more is by asking them open-ended questions like "What do you usually do to solve this problem." and not "Is this how you solve ths problem nowadays?" 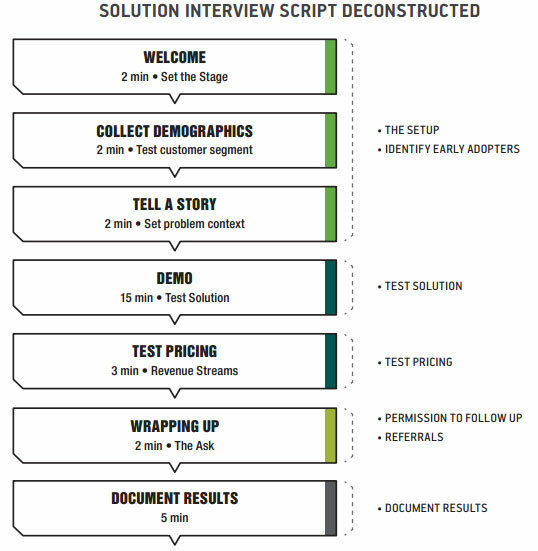 Optional: Look for Ash Maurya's Running Lean - “Solution Interview Script Deconstructed” for a more thorough interview strategy.